We Deals in Tube Mill Roll. In order to cater the variegated demands of our clients, we are offering an excellent quality range of Straightening Machine Rolls. We import SKD-11 which is the raw material of tooling roll from Japan. From incoming raw material to the finished products is assured by adopting advanced testing and inspection facilities and practising total quality control our products are worthy to be reliable. We are reckoned entity of this domain engaged in offering an enhanced quality Tube Mill Weld Roller. So as to furnish the ever-growing desires of our patrons, we are engrossed in delivering a comprehensive variety of MS Tube Mill Rolls. We are leading manufacturer and supplier of Pipe and Tube Rolling Mill Plants. It produces 12 MM to 65 MM pipes . High production takes place & cutting, straightening is also carried out. All type of tube mill roll with any profile any degree as per drawing. 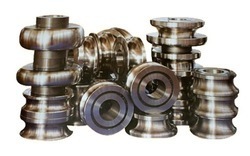 we have with us a comprehensive range of tube mill making machinery parts. Our tube mill rolls are manufactured using high grade material. 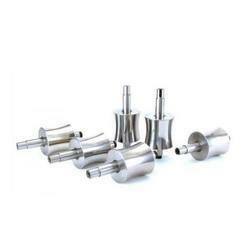 These tube mill making machinery parts have the provision to customize, our tube mill rolls are offered as per the requirements and specifications of our esteemed clients.